A big rig on its side after a crash on the 710 Freeway. 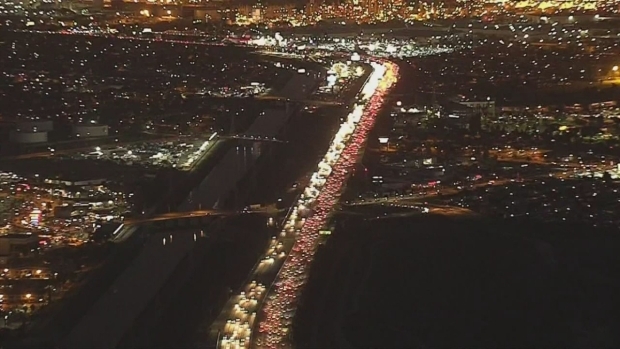 A big rig crash closed part of the 710 Freeway early Friday near Del Amo Boulevard, but Caltrans crews reopened the road just before the start of the morning commute. The southbound side of the freeway reopened at about 6:30 a.m. after the overnight closure. All northbound lanes were opened at about 6 a.m. The crash was reported at about 2 a.m. No injuries were reported. The truck driver told authorities he was traveling southbound when another driver cut him off, forcing him to swerve into and through the center divider. Another driver who stopped to help the truck driver was struck by a vehicle. "I saw this big old trailer," said the man who stopped to help. "I tried to help him out through the window, and someone rear-ended us." 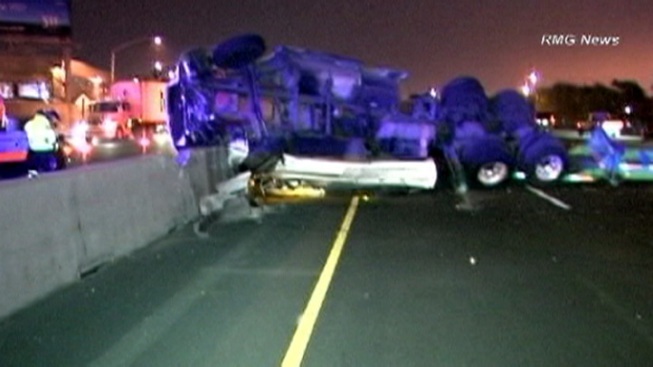 The big rig and trailer were on their sides across several southbound 710 Freeway lanes.